After a night back in Dar we dragged ourselves out of bed at 5.30am to catch the Kilimanjaro Express bus to Arusha. Arriving and setting up camp just before dark we settled on a restaurant two doors down (we were apparently on "mug street" about 3kms out of town). Tom opted for kilo of BBQ goat. The next day was spent wandering around comparing safari companies, finally settling on Monjes, a company recommended by Jacqui and Ed (who we met in Zambia). We scored ourselves a night at their lodge before and after the safari, so moved our things up and settled in. At about 10pm we were informed by the assistant manager "Innocent" that the two people we were supposed to be on safari with the next day had severe food poisoning so we'd have to push the trip back another day. The next day the four of us set off on safari - not before a double macchiato and picking up another passenger (Heidi from USA). Driving us out to Taragerie NP was our guide "Six". Six didn't talk a lot, and it turns out this was because he really didn't know a lot. Most valuable info was provided by Tom, who has taken to memorizing and paraphrasing the many lonely planet guides we are carting around with us. The boys had their hearts set on seeing a zebra, and after a slight (2 hour) delay at the gate we were excited to get our safari on - Justin had even bought himself a full safari outfit just for the day trip (photos coming). Countless elephants, antelope, giraffe, a lion that required binoculars to see and what we think was a cheetah (but may have been a leopard) later, we were yet to see a zebra. Gavin was especially disappointed as we left the park - they were only with us for the day and would be heading back to Arusha with another car coming to meet us. Except the other car wasn't coming. Calling the manager Brian after Six informed us they were catching a dalla dalla (minibus) the final 70kms, they were given a number of excuses and told there was no other option but for them to jump on the bus. Dropping them on the side of a highway in the middle of nowhere we could only hope for their safe return. Justin's parting words "good safaris aren't cheap and cheap safaris aren't good" soon became the catchphrase for the rest of our trip. After abandoning the lads we headed to Panarama Safari Camp, which lived up to its name by having a fairly stunning view over Lake Manyara. Dinner was surprisingly good, and after a brief acrobatic show, with the obligatory hat being passed around afterwards, we retired to our pre-set up tent. The second day was promising. Eggs for breakfast, informed that we were simply waiting on two new people to join the party and then off to the famous Serengeti. These two showed up late, not their fault, and we were then told the jeep had broken down and would be there "just now." Two peevish hours behind schedule, we rolled around the rim of Ngorogoro Crater, snapping a few photos, before arriving at the Serengeti gate. We went to eat lunch at the lookout point while our able guide sorted out entry. When we returned to the truck he ran off, and we figured he must just be finalizing details. Two hours later Tom went to find him. After being told there were "problems with the network", we waited another 45 minutes working ourselves into an angry mob, then marched on Six and demanded to know what was happening. He revealed that the company card had insufficient funds, due to a "theft at the bank"... And as such could one of us front the required cash and he personally guaranteed that we'd get it back. At this point his word was worthless, but finally, after nearly four hours in the car park, we headed in, the last car to do so before the gates closed. On the way to that night's camp, with the light fading, we had a very close call with a herd of zebras standing on the road. Probably the highlight of the day. We set up our tents at Pimbi Camp, only to discover that two out three were missing poles. Six instructed that we gather some sticks to replace these, and said he'd meet us at dinner. Over dinner we ordered some over priced beers, named Safari, from the lodge nearby, and exclaimed these lukewarm beverages to be by far the best safari we'd had all day. It rained slightly during dinner, which had been cooked ably by our chef, dubbed Snoop due to his likeness to the rapper. Upon returning to the tents we found that this minor bit of bad weather had led to bags and mattresses being soaked. Tom clambered about in the rain, guying out the tent with a broken sign and some rocks. The night's sleep was fairly poor (understatement). Day three and we were up before dawn for a morning game drive. For once we were on time, and though the overcast sky removed the chance of a classic Serengeti sunrise, there was a sense of expectation in the jeep. It was soon rewarded as we nearly ran over a young male lion, hunting with two females. 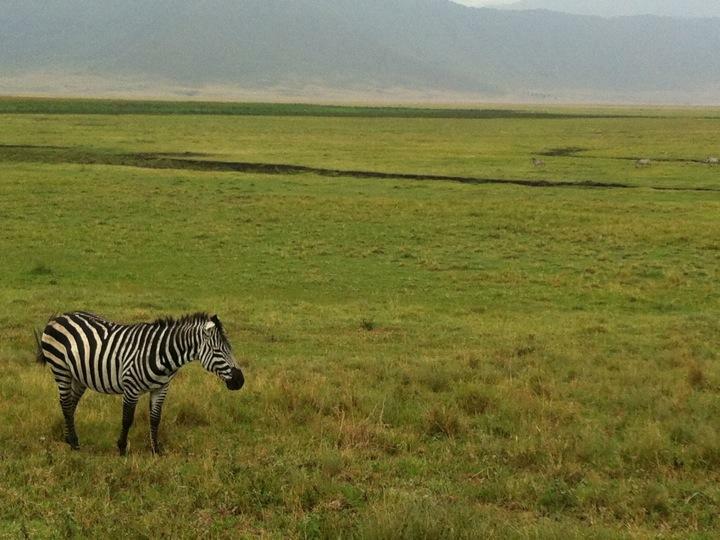 We looked in the direction they were headed, and a few hundred meters away stood a lone zebra. Looping around we got closer, losing sight of the lions. Every now and then the grass would flicker somewhere closer to the zebra and after several silent minutes one lioness pounced from the savannah, then the other. The zebra ran a few steps but it was too late. It went down kicking and the male lion strolled out for his share of breakfast. It was an absolutely unforgettable moment. The rest of the morning we rolled about, popping our head out of the top of the jeep when we felt like it. We saw some spectacular sights, such as a cheetah feeding on a fresh antelope kill, lounging lions a few feet from the jeep and a leopard lounging in the morning sun halfway up a tree. Returning to camp for lunch, we finally felt we were getting what we paid for. That afternoon we drove back to Ngorogoro Crater and camped at Simba A, on the crater rim. It rained slightly that night, and the tents once again flooded. A bad end to an otherwise supremely positive day. Sinking down the winding path into a cold and dark Ngorogoro Crater, we got our first spotting of a rhino. This, along with a few other of near-extinct Black Rhinoceros, and some cape buffaloes, ticked off the famous hunting "big 5" for our safari. We meandered about the crater, observing hippos bouncing about their lagoon, elephants sauntering across the grassland and a lake full of flamingoes. It was everything you want an African safari to be. The truck rolled back towards Arusha, and we felt far more satisfied than two days earlier. Nonetheless when we arrived back at Monjes we had some rather heated words with the operations manager/owner Brian. Mads put two years of a law degree into action, arguing ferociously, and correctly, that he had failed to live up to his end of the contract. We gave him money, he gave us a three quarter complete safari. After many efforts to pass the blame onto the bank, his driver and the weather, Brian finally asked what we wanted in compensation. We shot for a refund, and after a phone call to his boss (we envisaged him talking to a hand puppet) were told that this was impossible. We continued our good cop, bad cop routine, whereby Brian sought to speak to Tom man-to-man once Mads left the room. Eventually We said we'd settle for the fare paid to our next destination, Moshi. This was letting him off easily, as a deluxe bus would only cost him about $8 per person. He accepted, and we went and sunk beers until the anger faded. The next morning Brian was nowhere to be seen and we ended up on a bus that cost $3, between us, to Moshi. It played a wonderful selection of 90s hits, think A Night at the Roxbury, and stunk. We did make it to Moshi though, and reveled a the quiet, open streets, with only eight touts per block trying to sell you tours and paintings, compared to Arusha's thirty five. We settled into Kili backpackers, got some laundry done and basically spent the rest of the day organizing our climb up Mt Kilimanjaro. After the mess that was Monjes Safari we wanted this done right. Eventually settling with a well-reputed company, artfully bargained down $350 per person, with two nights accommodation thrown in, we celebrated with a fantastic vegetarian Indian meal and some rooftop beers. The day before our climb was spent preparing -last minute sock purchases, cold weather gear rental (it gets to -20 on the summit) and strepsils were the main targets. We lunched again at the Indian restaurant, called Milan's if anyone is in Moshi, eating fantastic thali. The place served some of the best food of the whole trip. We picked up a few Zanzibar pizzas to take back to the hotel for dinner, and bought flights home, but not for a few weeks yet. This brings us to the present. as we both lie awake, struggling to fall asleep due to the excitement of climbing the world's eighth highest peak tomorrow (or over the next six days). Hopefully the next time we write neither of us has terrible acute mountain sickness and have both climbed to 5986 metres.